Huda Quhshi with her daughter Munaya, 12, at the Day Without a Woman Strike on March 8, 2017 in Washington Square Park, Manhattan, NY. Quhshi, a Yemeni American, brought her daughter along to show her that women stand together. Many in New York City’s Yemeni community hail from rural regions in Yemen where there were few educational opportunities, especially for women and girls. Women maintained the household, reared the children and didn’t venture outwards in order to ensure their modesty. When Yemenis emigrated to the US, and settled in New York City, women’s roles continued to be centered around the household. Education was not a priority. Additionally, Dr. Alhuraibi believes that families also recognize that there is an economic incentive to educate women and encourage them to pursue careers. Orubba Almansouri, Sarah Alsaidi, and Huda Quhshi are three Brooklyn women paving the way for New York’s Yemeni American women to pursue an education and careers outside traditionally strict roles as homemakers. Huda Quhshi at her Hijabi salon, Le'Jemalik in Bay Ridge, Brooklyn, NY. 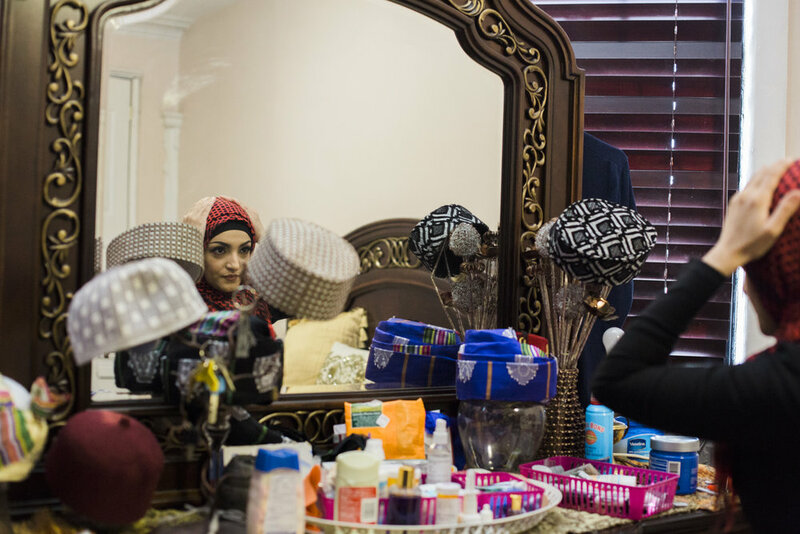 In January 2017, Huda Quhshi, a Yemeni American, opened the doors of her hijabi full service salon, Le’Jemalik, in Bay Ridge, Brooklyn, New York. The hijabi salon isn’t a new concept, but in New York, Yemeni women working outside the home is. When Quhshi first started providing beauty services to women outside her home, her husband was hesitant to encourage her traveling from house to house to provide beauty treatments, hair styling and make-up for hijab women in New York City. Ultimately, after Quhshi voiced her desire to open Le’Jemalik, both Quhshi’s husband and father supported her pursuit. With their blessings and support she opened her salon. Left: Huda Quhshi doing makeup for a wedding party at her salon, Le'Jemalik in Bay Ridge, Brooklyn. Right: Huda Quhshi on the phone with a client at her salon, Le'Jemalik, in Bay Ridge, Brooklyn. Huda Quhshi at her father's home in Greenpoint, Brooklyn, putting on her head scarf in preparation for the Day Without A Woman Strike. Quhshi closed her salon and encouraged her employees, all female, to attend. Left: Widad Indie, Rabyaah Althaibani, Althaibani's daugher and Huda Quhshi at the Day Without A Woman Strike in Washington Square Park, Manhattan, NY on March 8, 2017. Right: Huda Quhshi. March 8, 2017, Manhattan, NY. A koran sitting on the coffee table at Huda's childhood home in Greenpoint, Brooklyn. Quhshi, started questioning unchallenged rules within the Yemeni community. She started asking if a rule was haram, a sin forbidden by the Quran, or, ayeb, something culturally not accepted. It is using this guide that she lives her life. As long as she is following the Quran, she believes that in god’s eyes she is fine. Her family agrees. Quhshi driving herself and her second cousin home to Brooklyn after a long day at the salon. It's unusual for Yemeni American female immigrants from rural regions of Yemen to be out after dark. 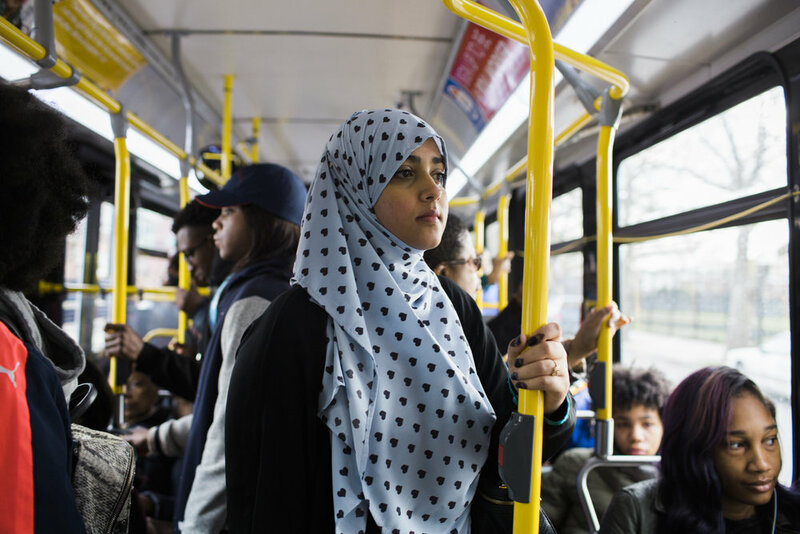 Orubba Almansouri on her commute to NYU where she is pursuing a master's degree in Middle Eastern studies. Orubba Almansouri is a soft spoken 23-year old Yemeni American women and the first person in her family to earn a college degree. Almansouri has a 9 p.m. curfew. She is currently in her her first year of a two-year master’s program at NYU after graduating from City College New York as her class’ salutatorian. She says in the 5 years she has commuted from Brooklyn to Manhattan for school she has never broken it. Orubba Almansouri at her home writing a paper in Canarsie, Brooklyn, New York. Almansouri tries to get some work done before the house comes alive once her nieces and nephews come home from school. She lives with her parents and sisters and her brother's family lives in the apartment below theirs. I think my father was afraid that if I went to college, I would want to leave the community. Almansouri printing reading materials for class at NYU in Manhattan, New York. 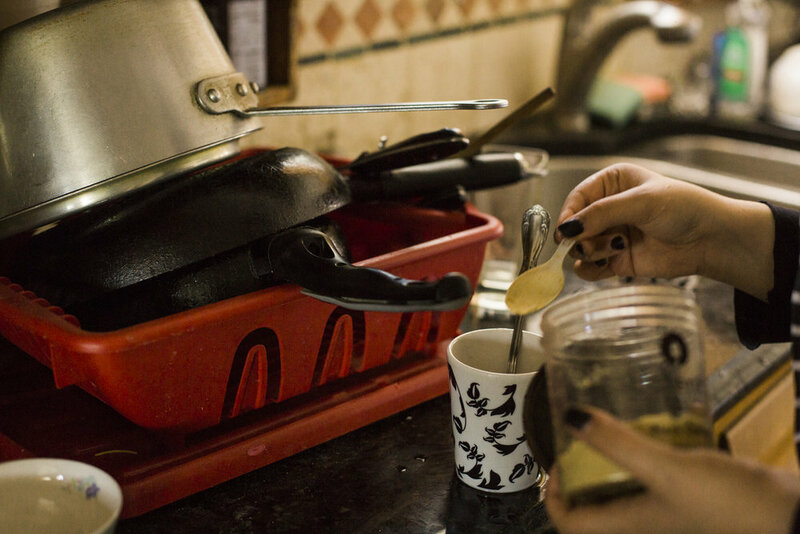 Orubba preparing Yemeni coffee for herself at her home in Canarsie, Brooklyn, New York. Yemeni women often marry young, under the age of 18, and bear children shortly after. Pursuing an education postpones and obstructs these cultural practices. Almansouri has had several marriage proposals, but rejected them all so she could prioritize her education, a decision endorsed by both her parents. Because their paths are atypical within the community, these women feel great pressure to be flawless in every other way. I definitely feel the pressure to be perfect. Almansouri at the library at the Kevorkian Center for Near Eastern Studies at NYU in Manhattan, New York. She modestly says that she doesn’t think she is special; that anyone can do what she is doing. But Almansouri is realistic about her community. She knows that whether she asks for it or not she is used as an example. She also knows that everything she is doing is under a watchful eye. Sarah Al Saidi, 25, student. Sarah Al Saidi leaving her grandfather's home that she and her husband were temporarily living in after their apartment building caught fire. Al Saidi says that her head scarf was one of the few things she grabbed as she and her husband fled their apartment. Sarah Al Saidi also finds the magnifying glass she is under to be overwhelming. She is a Yemeni American woman currently getting pursuing her doctorate in psychology from Columbia University. Sarah Alsaidi arrives at Teacher's College in Harlem, Manhattan, New York where she is pursuing her doctorate in psychology. Left: Sarah Alsaidi preparing for the second Annual Mental Health Awareness Conference at Teacher's College. Alsaidi was one of the lead organizers of the event addressing stigmas in intersectional communities. Right: Alsaidi in the crowd watching the keynote speaker at the second Annual Mental Health Awareness Conference at Teacher's College. She also knows women whose families are now regretful of their decisions not to prioritize their daughters’ education after seeing Alsaidi succeed. According to her, they realize their daughters could have also pursued their dreams and while maintaining the core values that they hold, like modesty in dress, their interactions with men outside the family and building a family. Sarah Alsaidi with members of her cohort catching up before a tutoring session in statistics at Teacher's College in Harlem, Manhattan, New York. Alsaidi feels fortunate that her family supports her decision to study as does her new husband who agrees to delay having children until they both are ready. Sarah Alsaidi at a planning meeting for the second Annual Mental Health Awareness Conference at Teacher's College. Sarah Alsaidi. Teacher's College, Harlem, Manhattan, New York. 2017. Ultimately, the decisions of Almansouri, Alsaidi, Quhshi and their families to support their endeavors come from the women’s commitment to their communities, their piety, and a cultural shift in seeing women’s accomplishments outside the home as beneficial to the greater community. For these three women, role models in the community were few or non-existent, but they are paving their own paths to success and leaving a trail for future generations to follow.